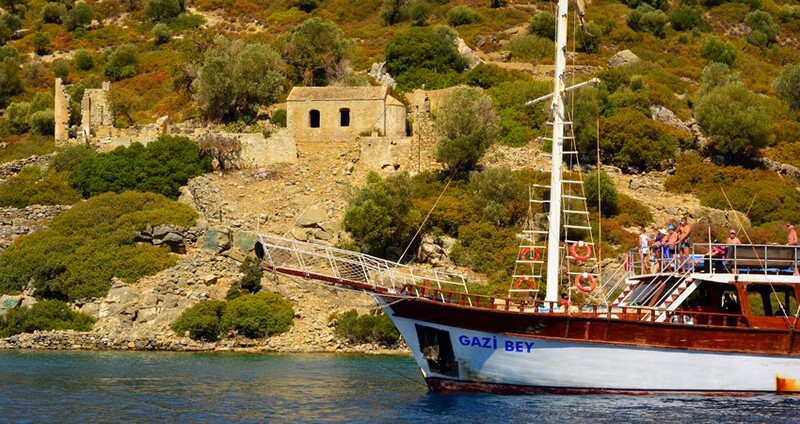 You can see the available dates for Aegean Islands Boat Trip. Please use the booking widget to make reservation. 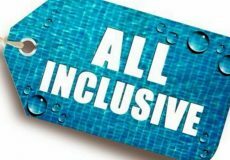 Our Aegean Islands Boat Trip is an all inclusive option that you must try once. This organised trip includes hotel transfer, lunch, drinks such as wine, beer, soft drinks and entertainment onboard. The tour begins at around 9:00 am and the tour duration is about 8 hours. 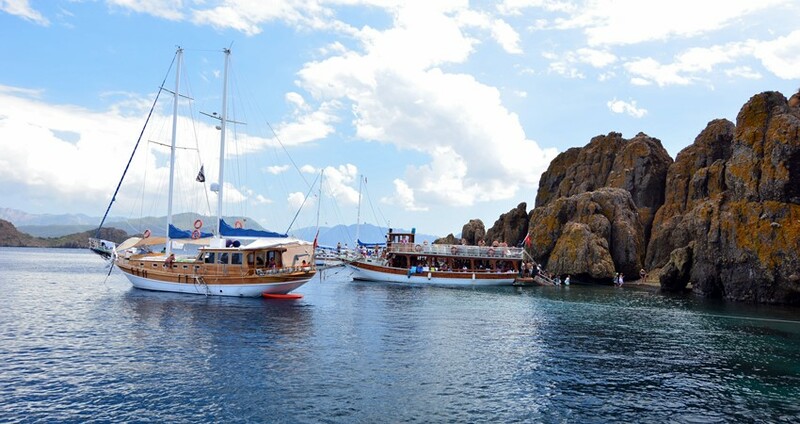 Marmaris has many little islands dotted across its coastline. These islands are known for their natural beauty, culture, and history as well. 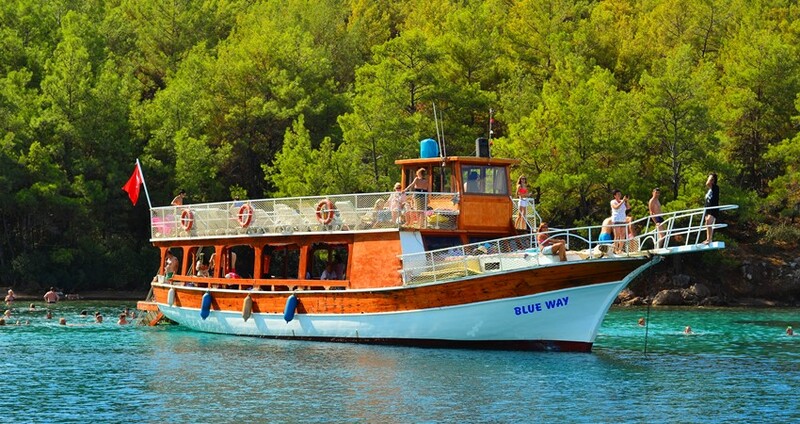 Aegean Islands Boat Trip begins with the sea journey from Orhaniye where the boat awaits our guests. 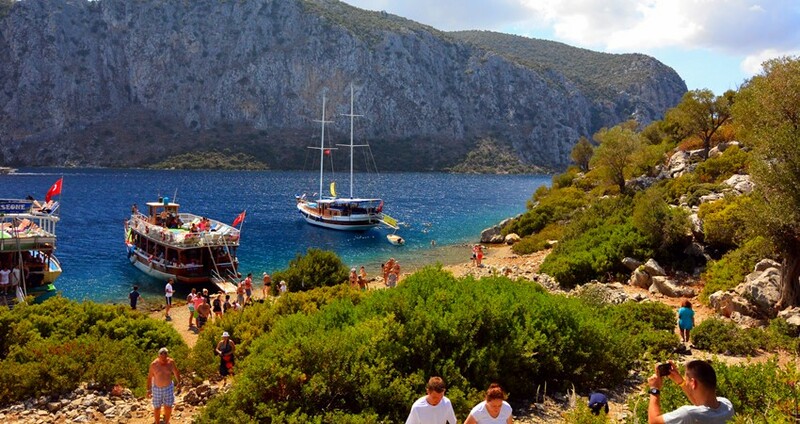 From there we move to Semiliye and take a swim break in the fabulous Hidden Bay. The greenery and the natural setting around this place is stunning. This area is not easily accessible and has mostly remained serene without much human intervention. 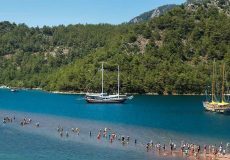 Our next swim break is at the Kamelya Island, this is a longer break where the guests are provided a luscious and traditional Turkish lunch. Kamelya Island is known for its historical Greek monastery. After the lunch we move to the Rabbit Island, stop there for a while, feed the rabbits and also take photos on the island. Next, we move on to Dislice (Toothy) Island. Previously known as Lovers’ Island, this unusual island looks like a monument made of volcanic rocks! Next, we move ahead to the Aquarium Bay. Swimming in the crystal clear waters of the Aquarium Bay is an amazing experience. 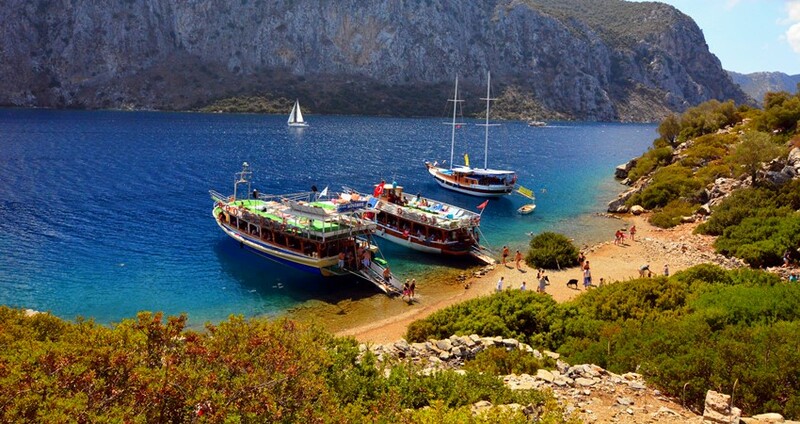 On our Aegean Islands Boat Trip we also visit Jesus Beach. Jesus Beach is one amazing spot you’ll be mesmerised for sure upon visiting. Walking over an elevated seabed with knee-deep waters and deep blue sea along both sides is an amazing experience. After visiting the Jesus Beach, we help our guests reach their hotels with our comfortable hotel transfer service. Unlimited Soft Drinks (Fanta, Cola, Sprite, Water, Tea, Coffee), Unlimited Alcoholic Drinks (Draft Beer, Local Wines), Lunch (BBQ Chicken, Salad, Pasta), Crew (English Speaking), Full Insurance, Hotel Transfer. Other Food & Drink Options. Personal expenditures. 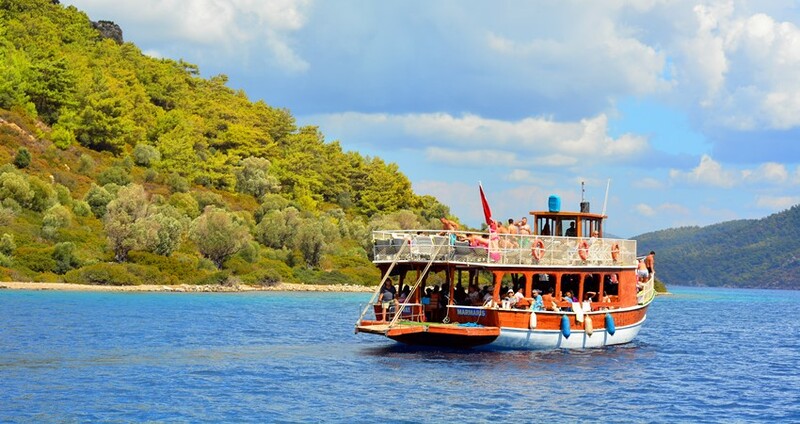 Categories of " Aegean Islands Boat Trip ( All Inclusive ) "
I have been visiting Marmaris for four years and it is definitely the one of the best boat trip to do. Perfect way to chill out in beautiful scenery, good value for money. There are plenty of beds in sun or shade or you can stay downstairs at the tables. The staff do everything they can to make sure that you have a brilliant day. Try it once and you'll be back again. Very nice boat trip with friendly People. 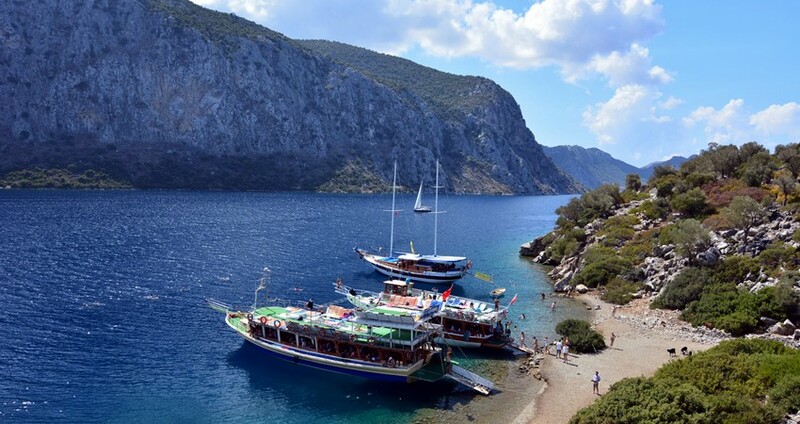 This trip was by far the most beautiful part of visiting Marmaris! Nice areas to visit, great food, very kind and polite staff, mostly Russian guests on the boat but intimate and peaceful atmosphere! I would recommend a trip on this boat! How long will drive take to the boat. ? Are there any historical sites to visit in this tour? Yes, when we stop at Camelya island, you can visit the ruins of an ancient Greek Monastery. 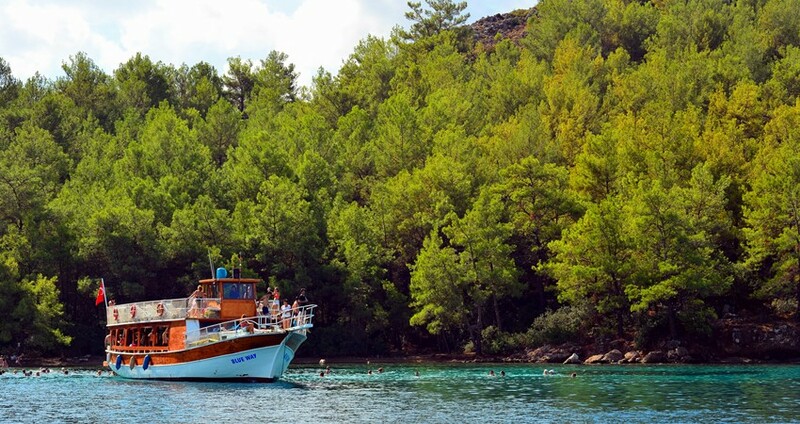 Orhaniye is just about 30 minutes away from Marmaris. After we pick up our guests from the hotels, we transfer our guests to Orhaniye. 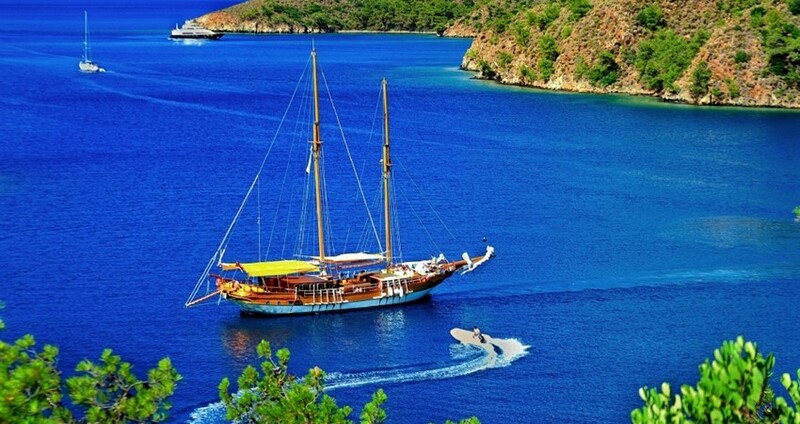 The traditional Turkish boat awaits our guests here. 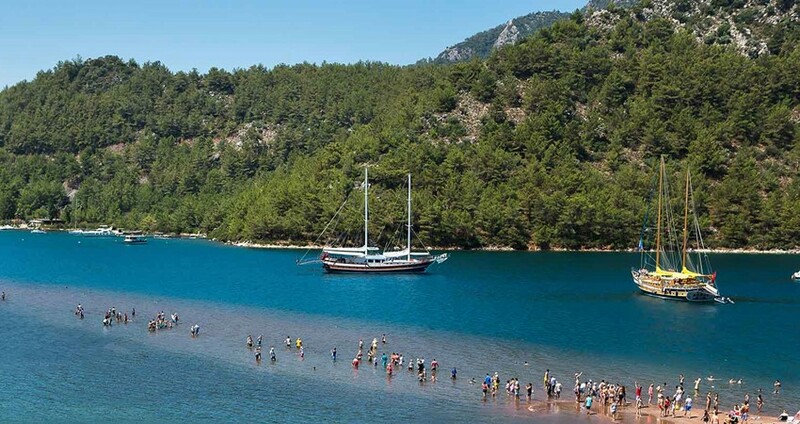 This our first swim break, it’s in Selimiye and known as Hidden Bay. This place lacks an approach road and can be only reached by boat. The place around is so serene and untouched by urbanization. You’ll love the greenery around. 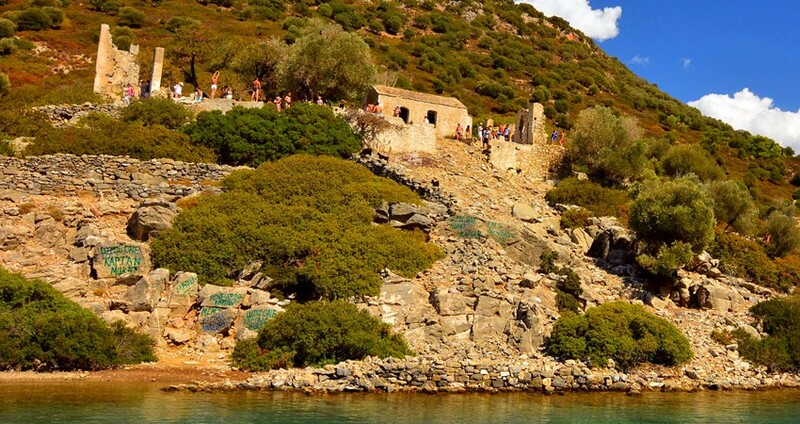 Kamelya Island is a very special island with interesting remains of a Greek Monastery. 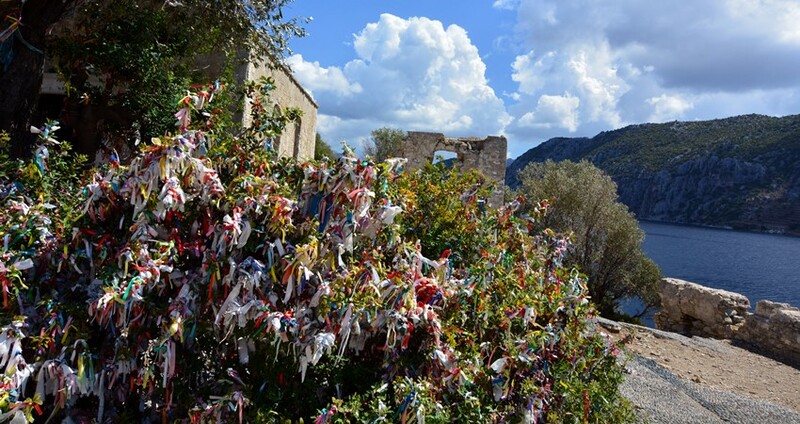 Many people visit this place, tie ribbons and pray for fulfilling their wishes. The turquoise blue water around the island is an added attraction. This is a unique place where history and the turquoise blue waters of Aegean Sea meet one another. After a swim break of about an hour, we are ready with a local and luscious lunch for you. Our next stop is at the Rabbit Island. This small island is inhabited by rabbits. We stop here for 10 minutes and let you take photos of them and feed them as well. The rocks on this island appear like teeth arranged in rows. This is an unusual small island formed by amalgamation of huge volcanic eruptions. 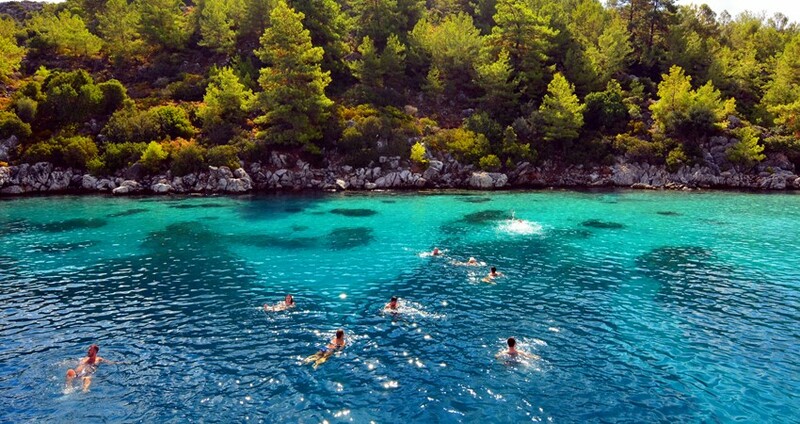 Located right in the middle of the Aegean Sea, this is an interesting spot to enjoy a swim break. The waters around this bay are crystal clear and you’ll feel as if you are looking into an aquarium. This is the reason why the locals named the bay as Aquarium Bay. This is our last swim break on the journey before sailing back to the Jesus Beach. 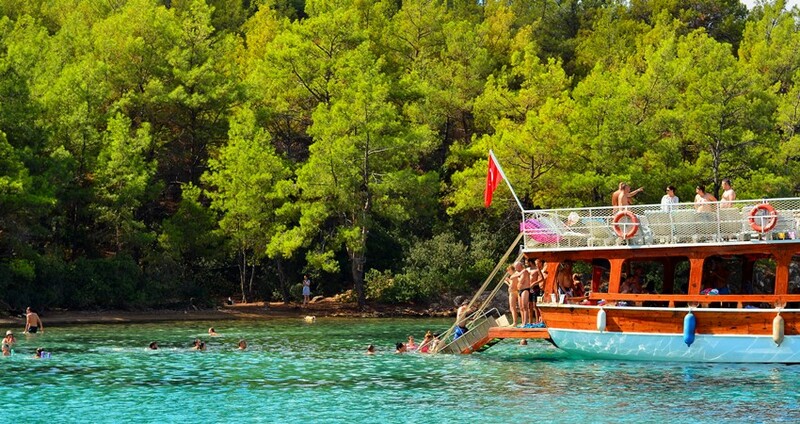 Before we begin our journey towards Marmaris, our last stop is at the Jesus Beach. Over here we have a 30-minutes stop where you can walk on an elevated sea bed bisecting the deep blue sea into two! Or you may choose to enjoy a swim break in the calm sea. 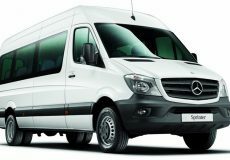 At end of the tour we catch our shuttle buses again, and transfer our guests back to their hotels. Around 17:30 in the evening, we make sure that you reach your hotels in Marmaris. 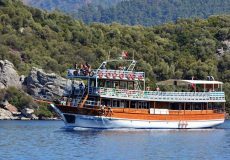 Some of the important facts and useful information about " Aegean Islands Boat Trip from Marmaris "